This has been suggested here before. Migrants from far away places can often bring viruses or bacteria with them that can have a big impact on the local population who have not developed the same kind of resistance to it. A secret, powerful and quiet weapon that cannot be ignored as a possibility. Maybe if we relate this to the apparent population bottleneck (some recent study about it) that most of Europe experienced at the time, and the huge founder effects that we see, we might have something interesting. Now that Lactase Persistance seems not to make a great case by itself, this hypothesis might be worth a closer look. The Americas are a perfect example of what new disease, can do to an indigenous population. From something like 50 million pre Columbian Amerindians to 5 million present day? Possibly you could see this as linked to the population turnover, although unlike with the Americas it would be harder to see why disease should go from one direction to the other (there it is clear that the larger Eurasian network and lack of the Beringian cold filter and different presence of domesticate animals and human related fauna generally seems to be what led to an imbalance in virulent disease, even if this may get exaggerated). Although there is still possibility - steppe populations from Afanasievo to Yamnaya could have picked up and had an adaptive edge on nasties from burgeoning agricultural populations of China, for instance, that weren't commonly around in West Eurasia (despite probably not much / any cultural contact with East Asia). The usual hypothesis on Black Plague is marmots in Mongolia, AFAIK. Yes! I find that the idea of plague-borne illnesses as a cause of European Neolithic depopulation brought from the East by steppe people far more plausible than steppe initiated genocide or wife-stealing. Not really wife stealing, but there was a substantial survival of Neolithic mtDNA lineages in Europe, so women were often incorporated into the new societies. Judging by the Y-chromosome evidence at hand, the men were not, or at least not as readily. There are several viable reasons for a Neolithic bottleneeck in Europe. 2. Farming collapse due to over exploitation of resources like soils. Immuno-impairment caused by poor diet caused by (1) or (2) could easily boost (3). Exactly ! 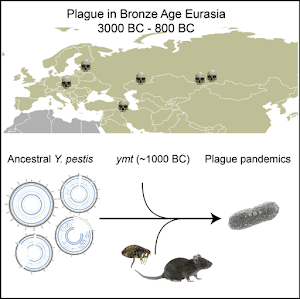 I suspect plague preceded the Bronze Age populations. It’s certainly a more sound explanation of why there was a late neolithic collapse- from central Anatolia to Scandinavia - without resorting to socially "imaginative" and chronologically impossible tales. This hypothetical plague appeared to have hit G2a men most of all. On the Y-chromosome lies the male-specific immunohistocompatability complex Y-HC, involved with T cell (CD8 and CD4 T cells) regulation. If not related to that, then it must also have been related to the overcrowded conditions of densely populated tell settlements and tepe, living in close quarters with animals, etc. the WHGs were more resilient because they were less densely populated and continued a broader economy, similar with the eastern pastoralist groups who moved in the wake of this population collapse into scantily uninhabited land in central Europe. The steppe nomads moved into post-Middle Neolithic Europe, not post-Early Neolithic/LBK Europe. There's no evidence yet that these plague germs existed during the last years of the LBK. The steppe nomads moved in after 3000 BC. That pretty late Neolithic. From the start I didn't believe in the male genocide theory. This is technically impossible. The survival of female lines will also find an explanation. It is also important to note that when a civilisation collapses men are affected more dramatically than women. Their morale goes down. Even if biologically they stay alive, they loose their will to live and procreate. We see how that happened in Amerindian population who were plagued by the alcoholism. Alcohol is another male line destroyer. I read somewhere that LN people also knew about opium. Btw after the Soviet collapse there was a dramatic fall in the male life expectancy in Russia and other CIS countries. So there are many reasons why male lines can end. This post of Davidski is important. It helped to me to become more convinced that there was no mass killing. No one said "Steppe" IEs committed mass genocide. You guys are arguing against a straw man. A select few IE male lineages became very popular and IEs made a big impact on overall ancestry, that's all. On Eupedia I saw ideas like that. Maybe not genocide but change trough violence. Btw I looked at the Basque R1b-M153 that You mentioned in the other thread. It is very interesting. It is only 2200 years old. But it is present in 11% of males of Biscay province. I think this gives a clue how Basque language survived with having so many R1b. ""Within the Basques studied by Alonso et al. (2005), R1b-M153 was found to be 11.1% in Basque from Biscay, 5.4% from Gipuzkoa and absent in Basques from Alava and Navarre. The authors further postulated that within Iberia the best candidate region for the origin of R1b-M153 was somewhere within or near to the Basque Country."" I see some people flirting with using the European/Native American relationship as a parrael, but I don't think it is in most ways. Relating it to disease and lose of morale in tribes makes sense. But overall it was a very differnt situation. Some 90% of Spanish colonist were male in some regions of Latin America. They brought in native women because they had no chose. The native tribes were desimated and all that is left of their blood is the women who moved into Spanish colonies. That's why today the vast majority of Latinos have Spanish father lines and native mother lines. But I know for example for some Mexicans that wasn't the case. Often they're 50% or more native and have native Y DNA. In French colonies it was the same. Almost all colonist were males who came for the Fur trad. In the British colonies men, women, children came. They established populations and they didn't include natives. So, there wasn't really any mixing the British and then Americans gradually took native land and the tribes were displaced. For the Basques I think the rhesus negativity is a frequently neglected factor. Rhesus negativity is one of strongest factors that can create a bias in the male lines frequency. For example a male with rhesus negative blood has a better chances to procreate in the Rh- women environment than a Rh+ male. ""Rhesus status only matters if you are a rhesus-negative mum who is carrying a rhesus-positive baby. Your child will have inherited her rhesus-positive status from her rhesus-positive dad. If some of your baby's blood enters your bloodstream, your immune system may react to the D antigen in your baby's blood. It will be treated as a foreign invader and your body will produce antibodies against it. This is known as a sensitising event or being sensitised. Sensitising is not usually harmful if it is your first pregnancy. But it can cause problems if you become pregnant again with another rhesus-positive baby. The antibodies that your body made in your first pregnancy can quickly multiply, cross the placenta and attack the blood cells of your baby."" Very few if any serious contributors mentioned anything about mass slaughter, although warfare seems to have been endemic *within* local farmer communities in Europe ; as it was likely later *within* the steppe- with mutually antagonistic pastoralist groups clambering for the best pastures and trade routes- hence the local turnovers, replacements and departure of one group to central-western Europe. 1. Massive Migration from steppe area creating large genetic impact both in WC Europe and SC Asia. 2. A specific reason for the population decrease of the pre-existing ''non-ie'' populations. The idea about nomads bringing new plague isn't exactly new; I was musing baout that something like two years ago and by that time I was told it's "an old story", that is, seems that others have heard about that idea years before. It also makes sense. Nomads lived with animals, and I suppose this should make easier to develop new plagues jumping from animals to humans. Scroll down to the Samara (pre? )Yamna ochred skull. Is this supposed to be "where it started from"? The analyzed ancient samples are from Afanasievo (2), Corded Ware, Sintashta, Unetice, and Andronovo (plus a later Armenian sample). They say in passing that the MRCA of these samples is datable to ca. 3,800 BCE. Is that what the ochred skull means, or is its inclusion just accidental? It doesn't look like any of the sampled Yamnaya remains carried the plague bacteria. So what they're really saying is that the common ancestral population of all of these people, which may or may not have been Yamnaya, was from the Eurasian steppe and carried the plague. @Dmytro I think they just chose that picture with the skull because it looks impressive. If you think about 6000-2000 BC covers 130 generations. You could easily fit all your direct maternal/paternal ancestors from that period in a school gym. The two major admixture events happened in short periods of time, you only have a handful of maternal/paternal ancestors who were alive. Between 2800-2500 BC(only 10 generations) most of our ancestors were probably apart of biracial couples, meaning one was mostly Steppe and one EEF/WHG. For example with my mtDNA U5b2a2, 1 of 10 was probably a pure EEF/WHG woman who married a Steppe man. >Between 6000-5500 BC huge swaths of Central and Mediterranean Europe were settled by EEF. That's only 17 generations! They rapidly expanded out of the Near East. Maybe for similar reasons. >Between 2800-2000 BC R1a-M417 groups went from their homeland to as far west as Denmark and as far East as West China, that's only 27 generations! They settled most of East Europe in only 7 generations! >The common Y DNA ancestor for the R1b-Z2103 Yamnaya probably lived only 30 generations before them! The same is true for R1a-Z93/Sintashta and R1b-P312/Bell Beaker. Within 30 generations 90%+ of men's paternal lines were replaced. Of all the 1,000s of men that lived only one had his paternal line survive. "I find that the idea of plague-borne illnesses as a cause of European Neolithic depopulation brought from the East by steppe people far more plausible than steppe initiated genocide or wife-stealing." No one has ever suggested wife-stealing was the cause of farmer depopulation. "Maybe if we relate this to the apparent population bottleneck (some recent study about it) that most of Europe experienced at the time, and the huge founder effects that we see, we might have something interesting. Now that Lactase Persistance seems not to make a great case by itself, this hypothesis might be worth a closer look." then you still have massive selection or founder effect in north and west Europe. If anything, it reinforces selection over founder effect because if the farmers were already gone why were the tiny percentage of IE with LP favored so much over the IE without it? These bacteria lack the flea associated genes. So they could only be spread by mammal to mammal contact. But this does not mean that they were any less deadly. It spreads through direct contact, but will kill people 90% of the time anyway. The flea transmission was a killer in later cities, where large domestic animals were at a distance. This could have been just as deadly when everyone lived in very close proximity to herds of mammals. In the Netherlands Scottish Highlanders are "employed" in a number of natural reserves, as a kind of aurochs substitute. Furthermore, Highlander cattle played an important role in the Heck Cattle experminent of the Heck brother in the 1930s. If there was an earlier spread of steppe dudes into the LBK as a small minority (metal workers, horse traders, bouncers, whatever) bringing their animals with them that could provide a vector.